This report examines the level of Latino local political representation in the ten counties of Washington State with the highest percentage Latino populations: Adams, Benton, Chelan, Douglas, Franklin, Grant, Okanogan, Skagit, Walla Walla, and Yakima. 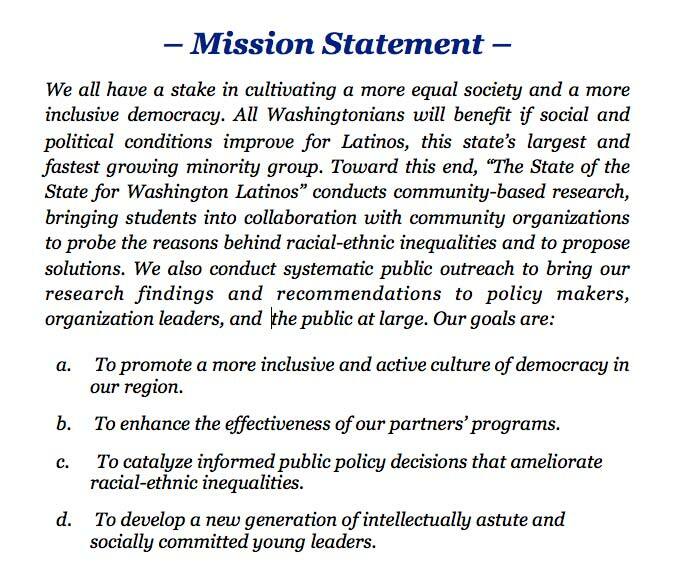 In particular, it is meant to build on previous research that found that Latinos were underrepresented on school boards and city councils in Sunnyside, Wapato, Toppenish, Granger, Pasco, and Walla Walla. I investigated whether such underrepresentation of Latinos was widespread across the state and in all local offices, what factors might be contributing to that underrepresentation, and what processes exist by which local officials and concerned citizens can begin to empower Latino voters and candidates. Methods: I first sought to find out what local voting jurisdictions exist in Washington State, the ethnicities of their office-holders, and the electoral systems under which they are governed. I obtained complete records from the ten counties examined and established the level of Latino representation in each county through.a surname-analysis of their office holders. I then examined the legal statutes governing the electoral methods of each jurisdiction. Lastly, I conducted a GIS analysis investigating the effect of sociodemographic factors on local political participation. Latinos are dramatically underrepresented in all ten counties examined. Out of 1891 local offices, only 78 are held by Latinos – a percentage of 4.1% despite percent Latino populations ranging from 14.8% (Skagit) to 55.1% (Adams). No political offices are exceptions to this pattern of underrepresentation. Nearly all local elections are conducted under at-large voting systems which tend to systematically reduce the influence of the Latino vote. In addition, state law restricts any changes to the method of election for most local offices. Latinos in the ten counties examined disproportionately possess the sociodemographic factors which contribute to low levels of political participation. The Washington State Legislature should amend the Revised Code of Washington to allow all local voting jurisdictions to change their voting method to a pure district-based or alternative system, either by referendum of the voters, discretion of the county auditor, or another suitable option. Latinos should form local-level political associations and seek support from their wider communities for measures that address the sociodemographic character of Latinos, such as providing bilingual voting materials or increasing youth involvement in the community. The Washington State Secretary of State’s Office should begin maintaining a current and comprehensive list of local offices in Washington State, their incumbents, and the ways in which they conduct their elections.